This tray for Burkhardt’s Beer is one of the most desirable post-prohibition trays among collectors. Exact dates for this tray are uncertain but best guess says it dates from the 1930’s-1940’s. The tray is a 12″ round manufactured by H.D. Beach Co. of Ohio. The tray shows a beautiful young woman smiling and holding up a glass of beer. 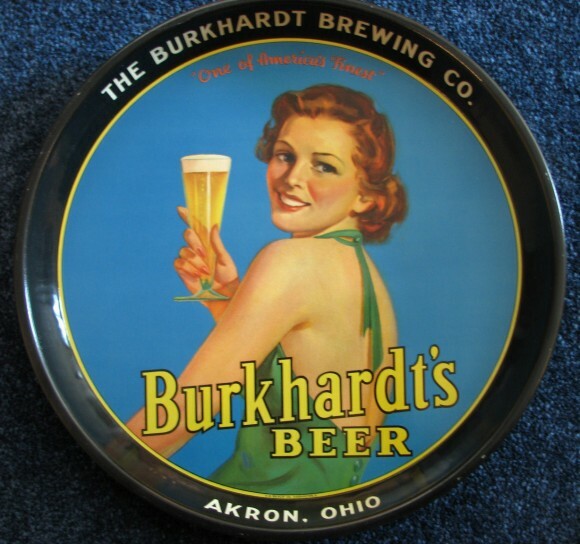 The tray reads “The Burkhardt Brewing Co. Akron, Ohio” on the rim and “Burkhardt’s Beer” “One of America’s Finest” on the tray itself. This a real winner of a tray and a great piece to have in any collection. If you have this tray please get in contact with us for an appraisal or offer.